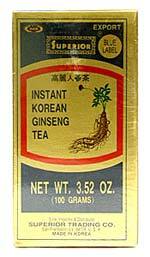 Korean Ginseng Instant Tea, 3.52 oz / 100 grams Jar (Superior Trading Co.) - Penn Herb Co. Ltd.
Korean Ginseng is an energizing root that increases vigor, energy and vitality. Plus it boosts mental performance and concentration WITHOUT the over-stimulating caffeine buzz. Simply add a spoonful to hot or cold water, stir and enjoy! Economy Jar. INGREDIENTS: Korean Ginseng Extract in Lactose base. Dissolve contents of 1 teaspoonful in a cup of either hot or cold water. Honey or other sweetener may be added to taste. HINT: Instant tea allows you to easily regulate the strength you desire and can also be added to other beverages.